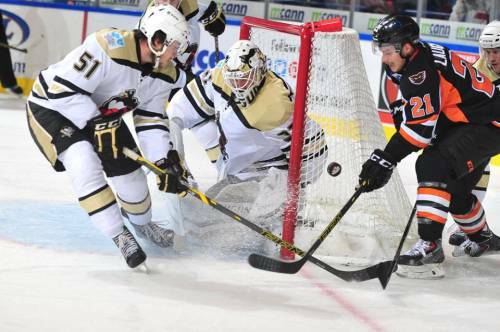 In a penalty-filled affair that saw both sides whistled for ten minors apiece, it was an even-strength strike from the first-year professional who leads the circuit in goal-scoring nearing the midway mark of the third period that allowed the Scranton/Wilkes-Barre Penguins to clip the visiting Lehigh Valley Phantoms 3-1 in the American Hockey League‘s latest all-Pennsylvania clash. After slamming a shot from the right wing off the crossbar, Penguins rookie Bryan Rust went to the front of the net and got another chance shortly thereafter when a Phantoms defenseman misplayed the puck while trying to clear a centering pass. The 23-year-old from the University of Notre Dame who was Pittsburgh’s third round selection (# 80 overall) at the 2010 National Hockey League Draft promptly scored just a little over eight minutes into the final period, forcing the puck past Lehigh Valley veteran goaltender Rob Zepp at close range. Rust leads all AHL rookies having now lit the lamp seven times in fifteen games this season. It was another Scranton/Wilkes-Barre freshman who had provided the Penguins with the opening tally almost eleven and a half minutes into the first period. Zepp made a fine save from a slapshot from Jean-Sebastien Dea, the undrafted and undersized 20-year-old from Laval, Quebec, who is currently tied for the team lead with 11 points (four goals) this season, but had no chance on the rebound. 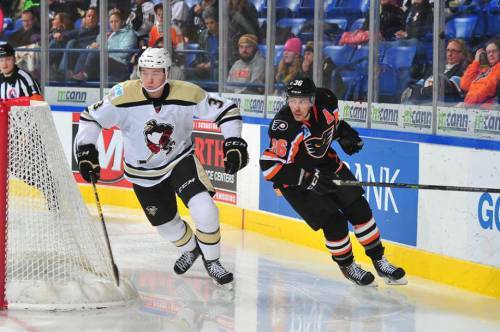 And so, Scott Wilson, the 22-year-old rookie left wing from the University of Massachusetts – Lowell whom the Pittsburgh Penguins tabbed in the seventh round (# 209) of the 2011 NHL Draft, was able to net his second goal of this 2014/15 AHL season. Phantoms defenseman Brandon Manning scored the visitors’ only goal of the game early in the third period with Lehigh Valley operating on the power play. The undrafted 24-year-old Canadian legionnaire took advantage of a screen in front of the crease set by countryman Zack Sortini, the veteran 29-year-old pugilist who has 256 NHL games for the Edmonton Oilers under his belt (14 go, 41pts, 718 pen.min.) and led the American Hockey League with 299 penalty minutes while skating for the Norfolk Admirals last season. Both the Penguins and Phantoms went a particularly unimpressive one for eight while skating with the man-advantage. Dominik Uher, the 21-year-old center who was the fifth round pick (# 144 overall) of the Pittsburgh Penguins at the 2011 NHL Draft as well as the assistant captain of the Czech Republic at the 2012 IIHF World Junior Championships, added a late empty net goal for Scranton/Wilkes-Barre. Lehigh Valley Phantoms center Scott Laughton (21), the Philadelphia Flyers’ first round choice (# 20 overall) at the 2012 National Hockey League Draft who captained Canada (7 ga, 0 go, 1 as) at the 2014 IIHF World Championships in Scandinavia last season, is confronted at the side of the Scranton/Wilkes-Barre net by the Penguins duo of goaltender Jeff Zatkoff, the 27-year-old veteran out of the University of Miami (Ohio) who spent all of last term in the NHL with the Pittsburgh Penguins (20 ga, 2.61 avg, .912 svpct) and defenseman Derrick Pouliot (51), the highly touted 20-year-old who was the first round pick (# 8 overall) of the Pittsburgh Penguins at the 2012 NHL Draft and also represented Canada (7 ga, 1 go, 5 pts) at the 2014 IIHF World Junior Championships last winter, of the during the American Hockey League derby match at the Mohegan Sun Arena in northeastern Pennsylvania. Notes — the slumping Phantoms have lost six out of their last seven AHL games while scoring a grand total of ten goals in the process.